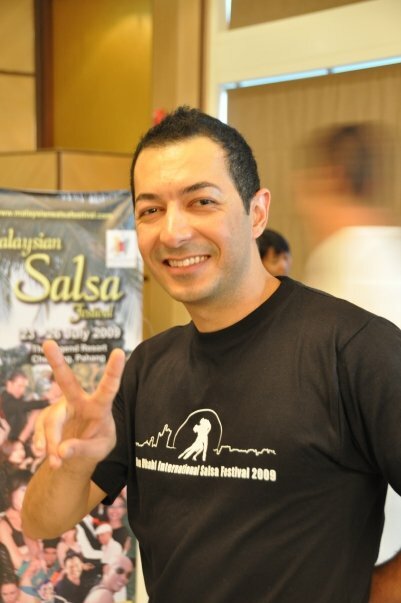 Are you attending the 2011 Abu Dhabi Salsa Festival? Abu Dhabi Salsa Festival Director & Producer, Jihad Shaban, speaks to Babbleonia about his passion for Salsa, and his next big gig! BSF: How would Jihad Shaban describe himself briefly? JS: Very sociable and has a strong passion for dancing & music, appreciative of art & talents. BSF: How did you come about to discover your passion for Salsa? JS: My passion to salsa started when I accidentally walked into a salsa party one night at one of the salsa venues back in 2004. The dancers moves and spins just took my breath away, I then knew I could get somewhere if I learn this passionate dance, but it was not until 2005 when I took my first salsa class. BSF: Describe Salsa in one word. BSF: What is your top salsa song, and why? JS: "Beautiful" by Edwin Rivera, I love the sound of the flute in this song. BSF: How did Abu Dhabi help you establish such a reputable name in the salsa scene? JS: I have lived in Abu Dhabi most of my life, Abu Dhabi holds people from all different nationalities and backgrounds, it's the capital of the UAE with an amazing life style and a very strong and stable economy, all these factors helped me and my team to take the Salsa scene in Abu Dhabi to the next Level by adopting the new concept of "Free classes for all" thanks to the generous sponsorships from the different venues where my team and I currently conduct our weekly Salsa classes in Abu Dhabi, this Strategy helped us increase the number of regular dancers in Abu Dhabi to a few more hundreds. BSF: Which salsa artist (dancer, singer) has most influenced Jihad Shaban? JS: Oliver Pineda in the way he performs & Jaime Jesus in the way he teaches and interacts with people. BSF: From the first Abu Dhabi Salsa Festival, what are the things have you learnt and have improved since? JS: I have learnt that no matter how big the event is and how many famous names you bring in to the event; the most important thing must be the Festival attendees and how to transfer as much learning as possible to them. I made sure we offer Festival passes at the cheapest rates possible, bring in the most sociable artists and those who are famous of their good teaching and interaction with the students in class and during the social dance parties. BSF: How is the 2011 Abu Dhabi Salsa Festival different from other festivals in the region? JS: The ADSF 2011 is 3 nights of shows, workshops and parties in addition to a pool party, after parties and other planned activities is being held at two of the most unique locations in the world, "Yas Island" which is now the home of all the big concerts and international events, strategically located between the coast and the city of Abu Dhabi and Dubai, with a range of world-class hotels, theme parks, golf courses, & mega malls and the home of Formula 1 Abu Dhabi Grand Prix, and " Etoiles club which is the winner of the best club in 2011 award ceremony, located in the 7 star Emirates Palace hotel, which will be hosting the closing night of the festival. Also During the social dance nights we will be having two different dance halls, one dedicated for Salsa & Mambo, and the other for Zouk & Bachata. BSF: What was the drive behind choosing Alex Lima & Big Spenders to be the festival's main attractions? JS: The main motive is to always present something new and different, Alex Lima is considered to be one of the best artists in the world in terms of Salsa footwork and solo shows, he also teaches a large and new variety of workshops which we didn't have in the last Festival, as for big spenders, this dance team has a great reputation and character in the international dance scene, they also provide a unique range of shows and workshops, Alex and Big Spenders are also known to be very sociable and people oriented, which is something we take very serious when we come to choosing our artists for the Festival. BSF: What are the targets for this year's festival? Numbers, figures etc..
JS: Last year we had over 700 attendees who actually bought their full passes to the Festival, this year we are expecting over 1000 attendees baring in mind the great feedback we received from last year's attendees, dancers and sponsors. BSF: How do you evaluate today's UAE salsa performers compared to the rest in the region? JS: Compared to the rest of the region, the UAE Salsa Performers are in a great shape and have a huge potential to grow even bigger , we have international performers who travel the world and perform in the biggest international Salsa and dance events such as The Moe Brothers, James & Alex, Aasim and Elena, Zouk Dubai & our International DJ Udia, and many others. BSF: What are Jihad Shaban's view for the future of salsa in Abu Dhabi? The UAE? JS: I wouldn't be surprised if soon we succeed to organize the biggest dance and Salsa Festivals in the world right here in Abu Dhabi, let's not forget that in a relatively short period of time we have managed to deliver this great concept of Salsa and dance Festivals where people get to watch, learn and dance, following all international standards just like in the biggest congresses around the world, we have every intention for achievement, so why not. BSF: Would you like to share any final thoughts with our worldwide readers? JS: Salsa must be about love, unity and accepting others, we must be careful how we teach it and deliver it to people, it's not only about learning the dance techniques, it must also be more importantly about modesty, politeness, creating and sharing the fun and happy moments. “Dancing with the feet is one thing, but dancing with the heart is another’. For more information about the 2011 Abu Dhabi Salsa Festival, click here. You too can be featured. Contact Babbleonia today and reach thousands of visitors! Enjoyed this interview? Like Babbleonia on Facebook!